Special thanks to the many friends and family members who helped advance the films’ production; to the reseachers and staff at the U.S. Department of Agriculture, the U.S. Apple Association and the National Sustainable Agriculture Coalition for vital background information; to the "farmers markets" community; to dissemination partners including Franciscan Action Network, Esperanza, The Foundation Center, Hispanics in Philanthropy and others; to supporters including Bread & Roses Community Fund, Scribe Video Center, the Leeway Foundation, Kit Miller and an anonymous donor. And most of all, thanks to the farmers and hired farm workers who participated in the films. The Franciscan Action Network, our main partner for disseminating the second Farm Labor film, "Apple Forecast: Immigration Reform", is a Washington, DC based non-profit group formed in 2007. 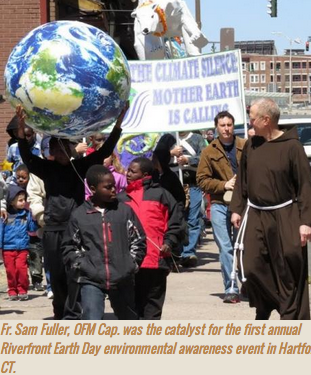 Inspired by the Gospel of Jesus, and the example of Saints Francis and Clare, the Franciscan Action Network (FAN) is a collective Franciscan voice seeking to transform United States public policy related to peace making, care for creation, poverty, and human rights. We are a grassroots organization amplifying the justice efforts of Franciscans and Franciscan-hearted people around the country. Join our growing movement that endures from St. Francis of Assisi and his call for compassion for the poor and for creation over 800 years ago. Many FAN members place a high priority on working for reform of the broken U.S. immigration system and addressed the issue before the Franciscan Action Network was created. Some members work directly with immigrant communities, some have a presence at detention centers, and many advocate for a reasonable, clear and achievable pathway to citizenship which prioritizes family unity. In collaboration with other organizations, especially with the Justice for Immigrants Campaign (JFI) of the USCCB and the Interfaith Immigration Coalition (IIC), FAN advocates in Washington, DC and in many states for immigration reform. Esperanza, our partner for disseminating the first "Farm Labor" film through the National Hispanic Prayer Breakfast, is a multi-service organization based in Philadelphia, PA. Esperanza founder Reverend Luis Cortés Jr. shared his ideas and extensive experience as an advocate as we crafted this short video to capture the attention of policy makers. Established in 1987 by Hispanic Clergy of Philadelphia to improve the lives of Hispanics in North Philadelphia, Esperanza is now the largest Hispanic faith-based community development corporation in the United States. We provide community development, workforce development, and education in our Philadelphia home base, and we provide capacity building and advocacy through our national network of Hispanic organizations and nonprofits. Driven by the Biblical mandate to serve "the least of these" as described in Matthew 25:40, we strengthen our Hispanic communities.